This version, the TL 125, is the 1-1/4” model. The Tow-Link™ is a light duty tow hitch which mounts in minutes to the Sport-Link™ adapter and is easily removed for storage. This class 1 light-duty hitch with a 150 lb. tongue weight is made of durable powder coated black steel and is capable of towing loads of up to 1400 pounds! A keyed lock secures it to the Sport-Link™. You can still access the hatch even when fully loaded. This incredible attachment allows you greater flexibility with your MINI. You will be able to safely tow your tires, small water craft, snowmobile, sports equipment, etc as long as it is under 1400 lbs. 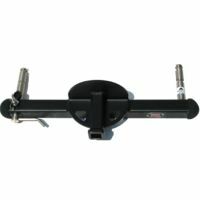 We recommend the use of the Modulite Protector unit for any trailer light hook-ups.